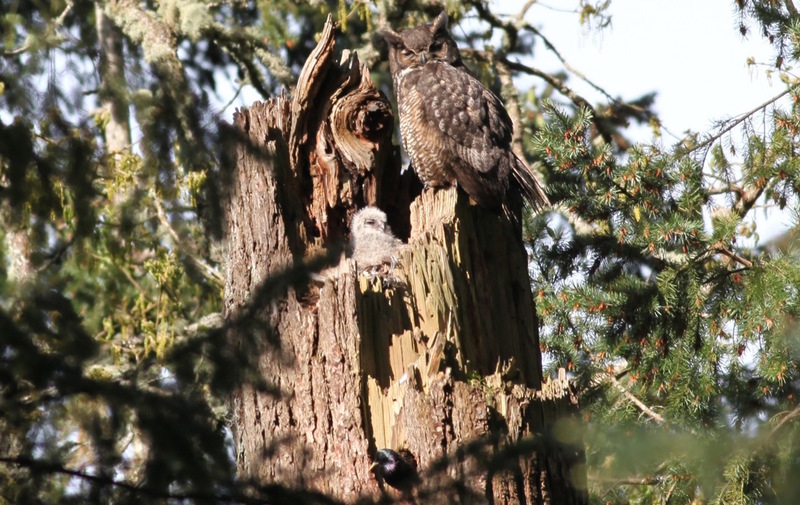 Each spring finds contributor Anthony Boutard of Ayers Creek Farm observing the pair of great horned owls that make their nest in a snag out behind the farmhouse. 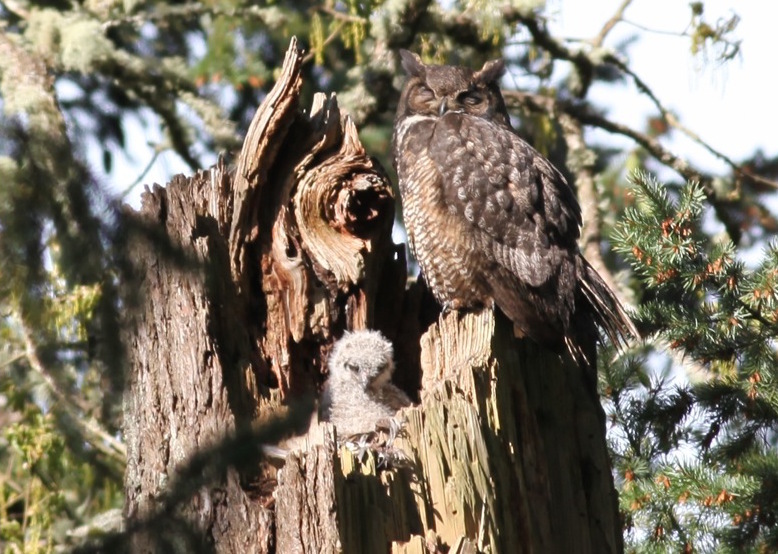 The eggs the female laid have now hatched and the young owlets are making their debuts. Here are some shots of the eldest great horned owlet. The first shot (top photo) caught a starling leaving her brood [the starling's head is poking out of a cavity at the bottom center of the photo]. The other owlet is still too small to sit up properly. 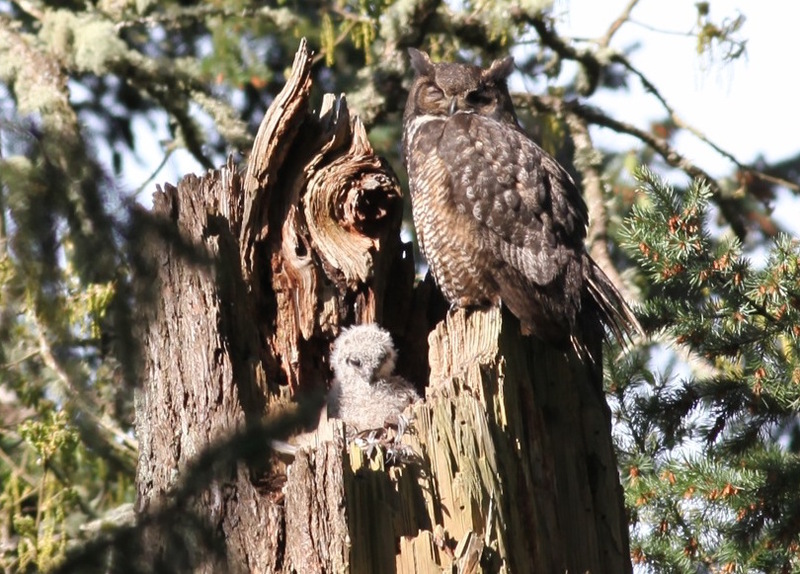 These owls start incubating their eggs as soon as they are laid, so there will be a noticeable lag in maturity between the first laid and the second. As far as I can tell, there are two chicks this year, which is normal. Other birds wait to incubate until the whole clutch is laid. The starling nesting in the cavity immediately below the owls follows this pattern, so all of her chicks will leave the nest within a few hours of one another. This decaying fir snag hosts many different birds, including nuthatches, chickadees, brown creepers and flickers. I wouldn't be surprised if a wren also found a suitable nesting cavity there. The owl's nest is about 150 feet from a red-tail hawk nest. That snag also hosts a variety of birds. Over the past two weeks, several pairs of wood ducks have been eying the nesting boxes we put up for them. It is hard to suppress a double take when you see a pair of ducks roosting in a tree. The birds nesting in the fir are all what is termed "altricial." Their young are helpless when born, and remain in the nest for a few weeks tended by their parents. The wood duck lays her eggs over a period of ten days to a fortnight, and then goes broody, just like her neighbors. When she starts incubating the eggs, the embryos will begin their development synchronously. However, her young are "precocial." Within hours of hatching, the downy young will leap from the nest and follow their parents to the water. Although ducks live on the water, the nests can be some distance away. At the farm, we have encountered mallard and black duck nests a quarter mile from the nearest water. Although these birds avoid the bald eagles, osprey and harriers that hunt the marshland, coyotes, weasels and skunks are on the prowl for those upland nests.